Shepherd’s pie is traditionally made with lamb meat, even mutton, though many times you will still find it filled with ground beef instead. 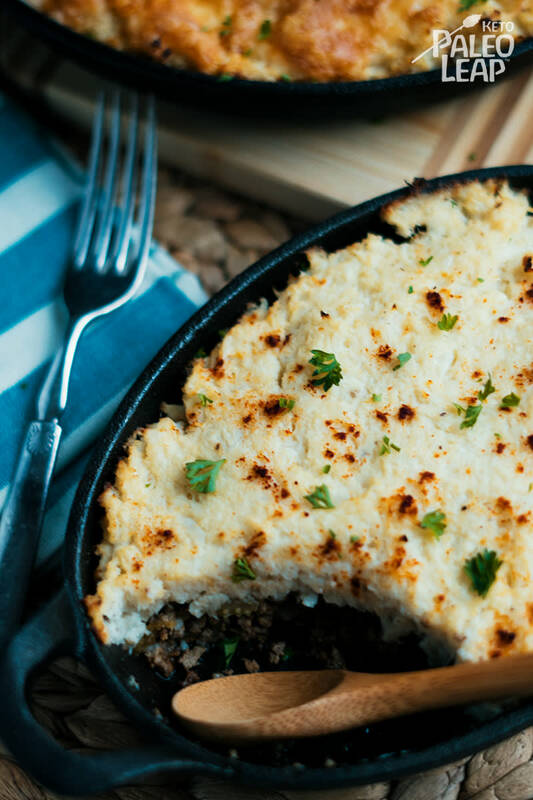 Technically speaking, that would be a cottage pie with minced beef, but we are not here to judge – so long as you skip those carby potatoes on top! Yes, we know that the taters are traditional too, yet we have to draw a line somewhere to keep on with a healthy keto lifestyle and carbs are the deciding factor. Once we get past the initial jolt of not eating them, the recipe modifications just get easier and easier. What can you substitute for a mash instead of potatoes? Cauliflower of course! It has all sorts of uses in Paleo cooking, but once your recipes migrate to the keto end of the spectrum, the possibilities of heavenly eating are endless. Whereas dairy may be limited for those eating Paleo, it is highly welcomed here. The ghee, the clarified butter, the cheese, the sour cream, the full fat yogurt… you get the picture. Again, we know it is not traditional, but you can also add some shredded cheese to the cauliflower mash if you so desire, for a little extra fat and savory flavor. If you are dairy-free, don’t despair! In many instances you can swap ingredients and use a bit less of coconut oil, or olive oil, and dairy-free cheeses are always an option. It will change the flavor just a bit, but we like to keep things non-traditional that way. Add cauliflower to a pot, fill with water and cover. Bring to a boil over medium-high heat and cook until florets are fork tender, 8 to 10 minutes. Drain well, add ghee, and season to taste; mash until smooth using a potato masher. Add the onion, celery, garlic, and cook 2 to 4 minutes; stirring often. Add the mushrooms and continue cooking until mushrooms are soft. Pour in the beef stock and season to taste, cook 4 to 5 minutes longer. Place the beef mixture in a casserole dish and top with the mashed cauliflower. Bake 15 to 20 minutes, or until the mashed cauliflower is nicely browned.